The filter or vents get dusty. You see a message telling you to clean it. The projector's Filter light flashes orange. Turn off the projector, wait for the projector to beep, and unplug the power cord. 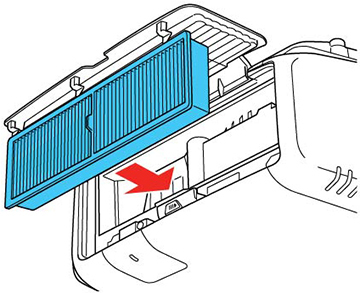 Slide the air filter cover latch and open the air filter cover. Pull the air filter out of the projector. 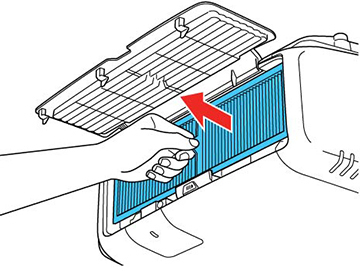 Tap each side of the air filter 4 to 5 times to shake off any excess dust. Do not use excessive force when tapping the air filter, or it may crack and become unusable. Do not rinse the air filter in water, or use any detergent or solvent to clean it. Do not use canned air; the gases may leave a residue, or push dust and debris into the projector's optics or other sensitive areas. Vacuum the front of the air filter (the side with the tabs) to remove any remaining dust. 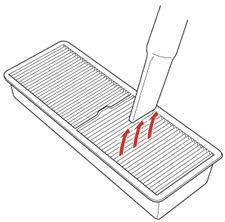 Note: If dust is difficult to remove or the air filter is damaged, replace the air filter. 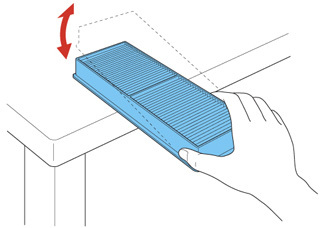 Place the air filter back in the projector as shown and push gently until it clicks into place. Close the air filter cover. You can replace the air filter while the projector is mounted to the ceiling or placed on a table. Note: Air filters contain polypropylene. Dispose of used air filters according to local regulations. 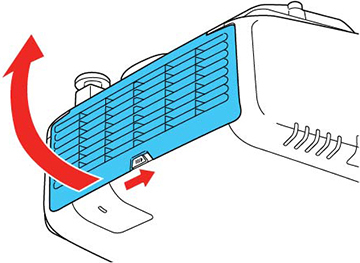 Place the new air filter in the projector as shown and push gently until it clicks into place.